Today the Greens launched a Denticare television advertisement which will screen during breakfast programs in regional areas across Australia to tell the Treasurer that Australian voters want to see more money for dental health in this year’s Budget. 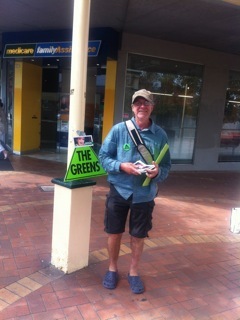 Bayside Glen Eira Greens Member collecting signature for the Denticare Petition in Centre Road Bentleigh on Friday. Good ideas are not hard to sell. We collected about 100 signatures in about one and half hours, and met and chatted with lots of good caring people. This entry was posted in Uncategorized on March 31, 2012 by Bayside, Glen Eira Greens. Thank you for finding our site, we are in the process of constructing, and more information and events will be posted as soon as possible. Drop by and keep yourselves updated with our news. This entry was posted in Uncategorized on March 30, 2012 by Bayside, Glen Eira Greens.